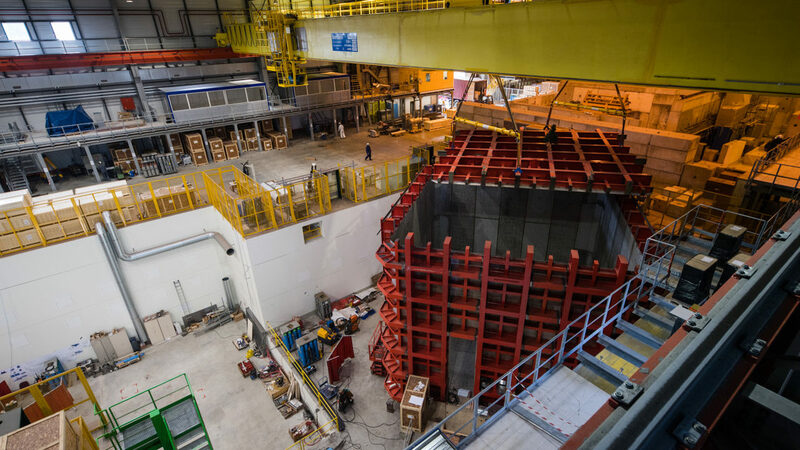 The enormous ProtoDUNE detector — the size of a three-story house and the shape of a gigantic cube — was built at CERN, the European laboratory for particle physics, as the first of two prototypes for what will be a much, much larger detector for the DUNE project, hosted by the U.S. Department of Energy’s Fermi National Accelerator Laboratory in the United States. When the first DUNE detector modules record data in 2026, they will each be 20 times larger than these prototypes. There will be four modules in total. The first ProtoDUNE detector took two years to build and eight weeks to fill with 800 tons of liquid argon, which needs to be kept at temperatures below minus 184 degrees Celsius (minus 300 degrees Fahrenheit). The detector records traces of particles in that argon both from cosmic rays and a beam created at CERN’s accelerator complex. Now that the first tracks have been seen, scientists will operate the detector over the next several months to test the technology in depth. 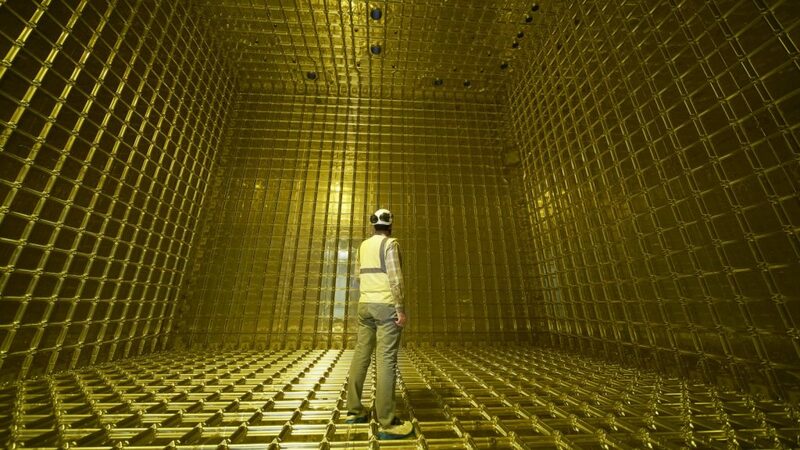 The technology of the first ProtoDUNE detector will be the same to be used for the first of the DUNE detector modules in the United States, which will be built a mile underground at the Sanford Underground Research Facility in South Dakota. More than 1,000 scientists and engineers from 32 countries spanning five continents — Africa, Asia, Europe, North America and South America — are working on the development, design and construction of the DUNE detectors. The groundbreaking ceremony for the caverns that will house the experiment was held in July 2017. DUNE comprises 178 institutions from 32 countries: Armenia, Brazil, Bulgaria, Canada, Chile, China, Colombia, Czech Republic, Finland, France, Greece, India, Iran, Italy, Japan, Madagascar, Mexico, Netherlands, Paraguay, Peru, Poland, Portugal, Romania, Russia, South Korea, Spain, Sweden, Switzerland, Turkey, Ukraine, United Kingdom, and United States. The DUNE interim design report provides a detailed description of the technologies that will be used for the DUNE detectors. More information is at dunescience.org. DOE’s Office of Science is the single largest supporter of basic research in the physical sciences in the United States and is working to address some of the most pressing challenges of our time. For more information, please visit science.energy.gov.